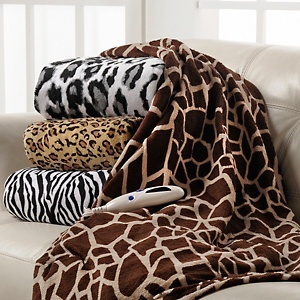 Save energy and still stay warm during cooler months with a heated throw. Settle in to those cold winter nights without raising the thermostat a single degree. Instead, adjust the temperature of your throw to your comfort level and enjoy the cozy feel of micro plush fabric against your skin. Available in Leopard, Snow Leopard, Giraffe or Zebra. Great gift idea!